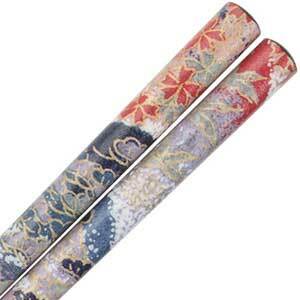 Washi Moon Autumn Flower Japanese chopsticks are 9 inches in length with full texture from tip to end. Made in Japan. 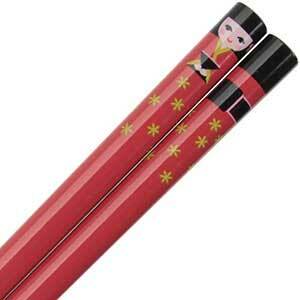 Semi-gloss finish red Japanese chopsticks with a fun apprentice geisha (Maiko) character design at the end of the handle. 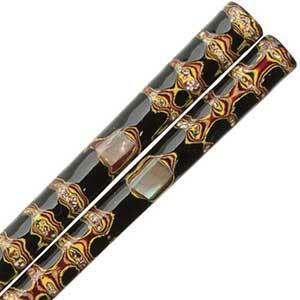 Blended profile handle. Smooth round tips. These chopsticks are 9 inches long. Made in Japan. 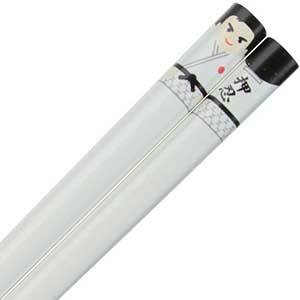 Semi-gloss white Japanese chopsticks with a whimsical black belt judo character design at the end of the handle. Blended profile handle. Smooth round tips. These chopsticks are 9 inches long. Made in Japan. 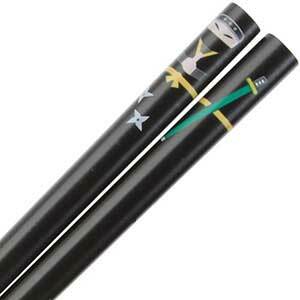 Semi-gloss finish black Japanese chopsticks with a whimsical design of a black ninja character at the end of the handle, complete with his sword and throwing stars. Blended profile handle. Smooth round tips. These chopsticks are 9 inches long. Made in Japan. 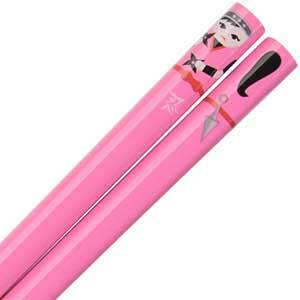 Bold semi-gloss finish pink Japanese chopsticks with a fun girl ninja character design at the end of the handle, complete with her pony tail, dagger and throwing stars. Blended profile handle. Smooth round tips. These chopsticks are 9 inches long. Made in Japan. Semi-gloss grey Japanese chopsticks with a Japanese rebel biker character design at the end of the handle. Dude is wearing a black biker jacket while riding his red motorbike. Blended profile handle. Smooth round tips. These chopsticks are 9 inches long. Made in Japan. 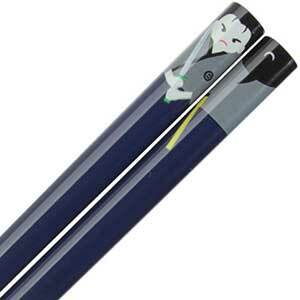 Semi-gloss dark blue Japanese chopsticks with a whimsical ronin character design at the end of the handle. A ronin is a warrior without a master. Blended profile handle. Smooth round tips. These chopsticks are 9 inches long. Made in Japan. 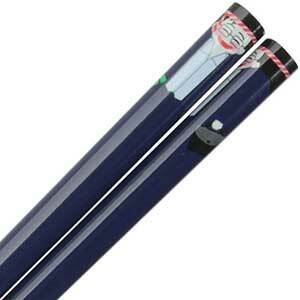 Semi-gloss dark blue Japanese chopsticks with a smiling, rosy-cheeked salaryman character design at the end of the handle. Happy from visiting the bar after work with his bento box and briefcase in hand. Blended profile handle. Smooth round tips. These chopsticks are 9 inches long. Made in Japan. 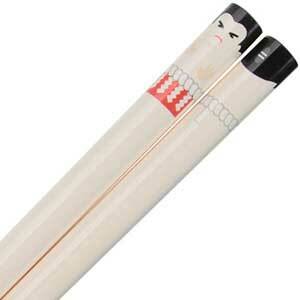 Semi-gloss flesh-pink colored Japanese chopsticks with a fun sumo wrestler champion character at the end of the handle. Blended profile handle. Smooth round tips. These chopsticks are 9 inches long. Made in Japan. Semi-gloss white Japanese chopsticks with a fun and whimsical sushi chef (Itamae) character design at the end of the handle, holding his fish and brandishing his sashimi knife. Blended profile handle. Smooth round tips. These chopsticks are 9 inches long. Made in Japan. One of the most famous woodblock prints of Mt. Fuji from Hokusai 36 Views of Mount Fuji series. 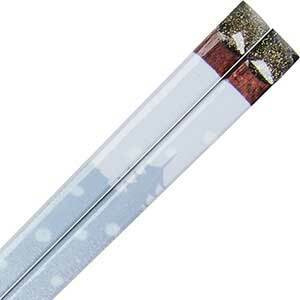 Mount Fuji on white gloss chopsticks. This particular image is Hokusai The Great Wave off Kanagawa, one of 36 woodblock print paintings he created during the 1820s. Chopsticks are 9 inches long with blended profile. 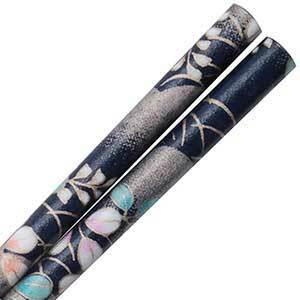 White chopsticks made in Japan. 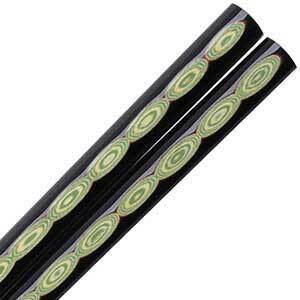 Japanese style chopstick. 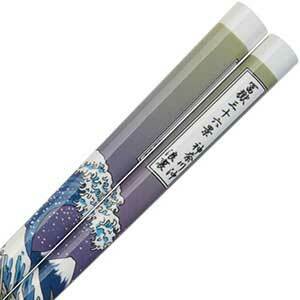 Dark brown wood chopsticks showing a Geisha in winter on a white and blue-gray gradient background. 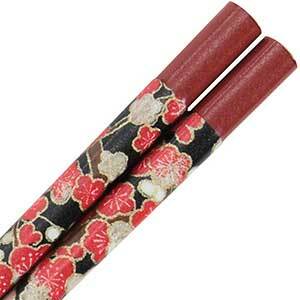 Very fine quality chopsticks with square handles and textured tips. 9 inches long and made in Japan. 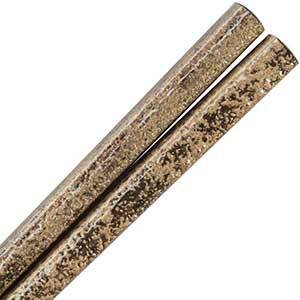 Richly grained dark wood chopsticks with a rustic stippled antique gold finish on the handle. 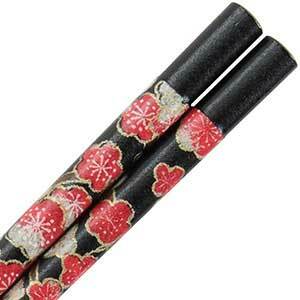 These Japanese made chopsticks have a blended profile with textured tips, are 9 inches long and made in Japan. 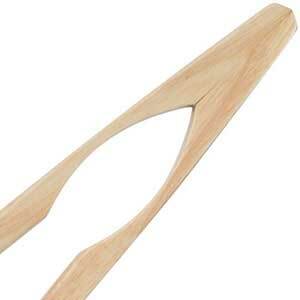 1 pair of chopsticks.